Staraya Ladoga was the capital of ancient Rus from 862 to 864. According to chronicles, Varangian (Scandinavian) leader Ryurik came to Ladoga in 862 and became the first known ruler of Rus. Possibly the greatest attractions in this lovely town are the Staraya Ladoga Fortress that dates back to 1116 and its wooden chapel. The fortress is home to an excellent exhibition that tells Ladoga’s history through maps and archeological excavations, as well as the famous, 12th-century St George’s Cathedral, one of Russia’s oldest churches, containing frescoes painted in 1167. Among many other attractions in the town, you can also see the Uspensky Monastery and the Nikolsky Monastery. The legendary leader Ryurik moved the Rus’s capital to Novgorod the Great, and it remained the center of the country until 882. Today, it’s one of Russia’s oldest and most important historic cities, the administrative center of Novgorod Oblast, and a World Heritage Site, famous for its medieval monuments. 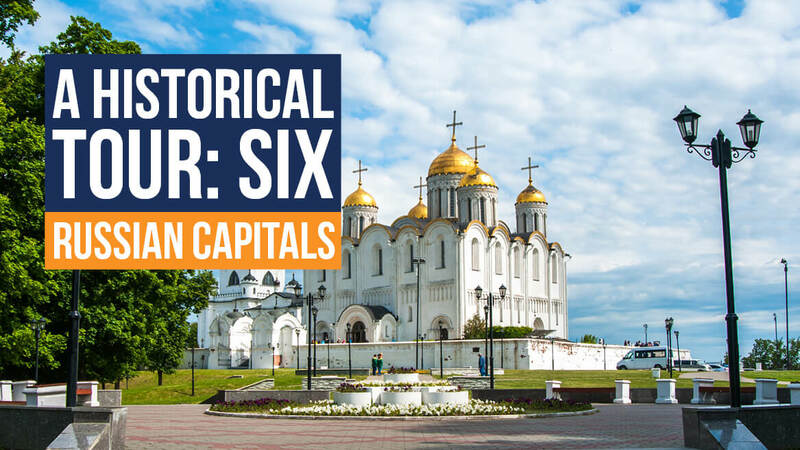 You can visit the 11th-century St. Sophia Cathedral with its 12th- century frescoes, the large 12th-century St. Nicholas Cathedral in the Yuriev Monastery, and the 12th-century cathedral in the Antoniev Monastery. In the Novgorod Kremlin, you’ll find the oldest palace in Russia, the Palace of Facets, built in 1433, as well as the oldest Russian bell tower and Russian clock tower. Afterward, visit the remarkable Millennium of Russia. Close to the Yuriev Monastery, you’ll find a wonderful museum of wooden architecture. Today, Kiev is the capital of Ukraine. Back in 882, it was most likely Ryurik’s successor, Oleg, who moved the capital of Rus to Kiev, expanding the ancient state and uniting its two most powerful centers. Like Ladoga and Novgorod, Kiev was situated along the ancient Varangian trade route that stretched to the Constantinople. The city is home to many high-tech industries, higher education institutions, galleries, museums, such as the Museum of The History of Ukraine in World War II, and numerous famous historical landmarks, including the 19th-century Kiev fortress, once a part of the Western Russian fortresses. Kiev is also well-known as a green city with two botanical gardens and a myriad of parks. Located on the Klyazma River, Vladimir served as the country’s capital in the 12th and 13th centuries. Prince Yuri Dolgorukiy ruled in Kiev for only a few years in the mid-12th century, but his son, Andrei Bogolubsky, seized the city, pillaged it, and left to Vladimir. Being a part of the Golden Ring, Vladimir is very popular with tourists. Its White Monuments of Vladimir and Suzdal have been designated as a World Heritage Site. You’ll see here, among other magnificent edifices, the five-domed, 12th-century Assumption Cathedral, the 12th-century Cathedral of Saint Demetrius, and the famous Golden Gate, built in the 12th and reconstructed in the late 18th century. You’ll find other outstanding monuments of pre-Mongol Russian architecture all around the city. After Vladimir, it was actually Moscow that became the capital in the mid-16th century. In 1712, Peter I relocated the capital from Moscow to St. Petersburg, nine years before the Russian Empire was founded, and it remained the capital until the Empire collapsed in 1917. Today, Saint Petersburg is home to a momentous historical and cultural heritage. It is one of Russia’s most modern cities and its cultural capital with a myriad of theaters, museums, libraries, concerts, festivals, etc. The Historic Centre of Saint Petersburg and Related Groups of Monuments, with thirty-six historical architectural complexes and around 4000 remarkable individual monuments, have been designated as a World Heritage Site. The city’s 18th and 19th-century architecture is so well preserved that St. Petersburg can be viewed as a fantastic museum of European architectural styles spanning three centuries. When Yuri Dolgorukiy established Moscow, it was a small town in the Suzdal-Vladimir principality. It became the country’s center when Dmitry of the Don made the Grand Duke title a hereditary possession of Moscow’s princes in 1380. When Ivan the Terrible declared himself a tsar in the mid-16th century, Moscow became the capital of the Tsardom of Russia. Following the February Revolution of 1917, the Bolsheviks moved the capital back to Moscow from St. Petersburg in 1918. Today, Moscow is a major political, economic, cultural, and scientific center of Eastern Europe. Some of the most famous attractions include the city’s UNESCO World Heritage Site – the Kremlin and Red Square, as well as the Church of the Ascension, but also numerous parks, such as Gorky Park, Neskuchny Garden, Izmaylovsky Park, Sokolniki Park, Losiny Ostrov National Park, Botanical Garden of Academy of Sciences, etc.